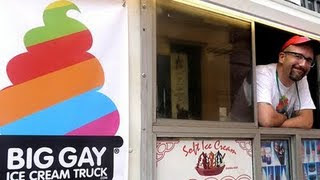 OMG I want some big gay ice cream!! You'll just have to come visit, now won't you? Eshan and I got some soft serve from him when he showed up on 47th and 6th ave. He was surrounded by squealing fans. Doug is a total rock star now. For the ice cream, not the bassoon (though maybe that too). It's hilarious, but totally understandable—his concoctions are delectable and he's an awesomely friendly, funny guy.